Sheep, Apes, Octopi: New Games in Google Play! 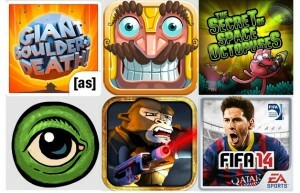 Home » News Android » Sheep, Apes, Octopi: New Games in Google Play! 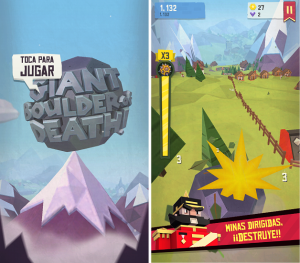 Giant Boulder of Death is a completely free game and is finally available for Android . If you enjoy innocently creating chaos and virtually wreaking destruction and havoc, then this is your game. Using large rocks which you shoot from a cannon, you can destroy houses, fences, fields, and even forests. The more you demolish, the more points you will score. You’re also able to buy upgrades which increase ammo ie. your rocks, as well obtain more control over time, accuracy, etc, although these aren’t really necessary to have fun with the app. The game takes place with a backdrop of a beautiful Alpine scenery rendered with retro graphics. 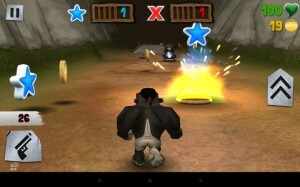 The game consists of meeting different targets, such as destroying 20 cows and 50 trees in one shot, for example. In Sheep Happens, you step into the shoes of an Olympic runner from Ancient Greece in which you encounter different obstacles while attempting to collect as many coins and sheep on the road as possible. Addictive? Yes. Fun? Ridiculously. Thanks to the humorous graphics, this game could very well become your next pastime. 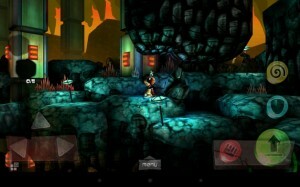 The game also incorporates a large number of power-ups, which can be acquired through in-app purchasing. As you know, these do the normal task of boosting certain qualities and going faster. Jungle Rampage has you setting forth as a monkey through a mysterious temple full of coins, stars, ammunition and many bonuses. All of these items, which you must collect, are then useful when battling heavyweight cyborg monkeys who won’t hesitate to attack you. To play the game, it’s a mix between using the touchscreen and moving your smartphone or tablet by tilting to one side or another. 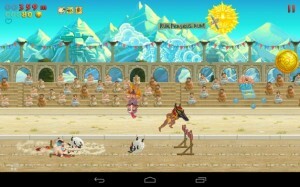 No aping around with this game, you’ll need to skillfully grab new weapons and equipment for your fights. The graphics and user interface were also well designed. Warning: you may have more fun than you had anticipated! If you’re looking to travel to a totally magical and robotic realm, don’t miss The Secret of Space Octopuses. In this game, your earthling, Little Buddy, will embark on adventures through labyrinth-like levels where he run, jump, slide and collect materials and trash in order to build a robot. The little dude must also face his alien captors, the Space Octopuses (not Octopi) and try to crack their secrets. The game is presented as a cartoon that leaves a lot to the imagination, not everything is what it seems! Looking, listening and exploring will bring you success in this Android app where you are offered a lot to discover. It’s interesting to point out that the robot is completely indestructible and the more you play, the more chances you will have . This app costs 2.58 USD right now.